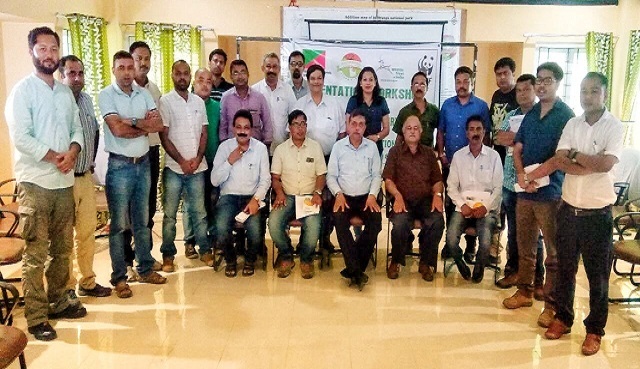 The Kaziranga National Park (KNP), WWF-India and Wildlife Trust of India jointly organised a one-day orientation workshop on wildlife issues for the veterinary officials of the bordering districts of Kaziranga National Park on Monday. The workshop was held at the Convention Centre of Kaziranga National Park at Kohora. The workshop was presided over by KNP director Akash Deep Baruah. Addressing the programme, the KNP director emphasised the role of veterinarians in wildlife conservation and urged all the participants to share their knowledge and experiences. Renowned veterinarian Dr Kushal Kr Sharma of College of Veterinary Science, Khanapara and Dr Apurba Chakraborty, Director of Research (Veterinary), College of Veterinary Science, Khanapara were present on the occasion. Experts from Wildlife Trust of India, WWF-India and wildlife research officer of the KNP Robin Sarma spoke on various issues related to wildlife forensics, veterinary science and wildlife rehabilitation. The veterinary officials from Jorhat, Bokakhat, Karbi Anglong, Sonitpur and Biswanath along with the various NGOs were present in the programme. The workshop was the first of its kind organized for the state veterinarians on wildlife issues. Rohini Ballave Saikia, DFO, Eastern Assam Wildlife division gave the concluding remarks and vote of thanks.